Celebrity Big Brother made its Season 2 return January 21, and things kicked off with a bang in the beloved Big Brother house. From returning hosts to highly anticipated guests, we're taking a look at some of the evening's biggest moments, but beware of spoilers and unexpected twists ahead. Undoubtedly, one of the biggest moments of the evening was the TV return of Julie Chen Moonves, who left The Talk following her husband Leslie Moonves's ousting from CBS. Thankfully for die-hard Big Brother fans, the TV personality couldn't pass up her hosting duties of the beloved reality series. As with her last few episodes of the prior Big Brother season, she opted for introducing herself as Julie Chen Moonves, versus her original intro as just Julie Chen. 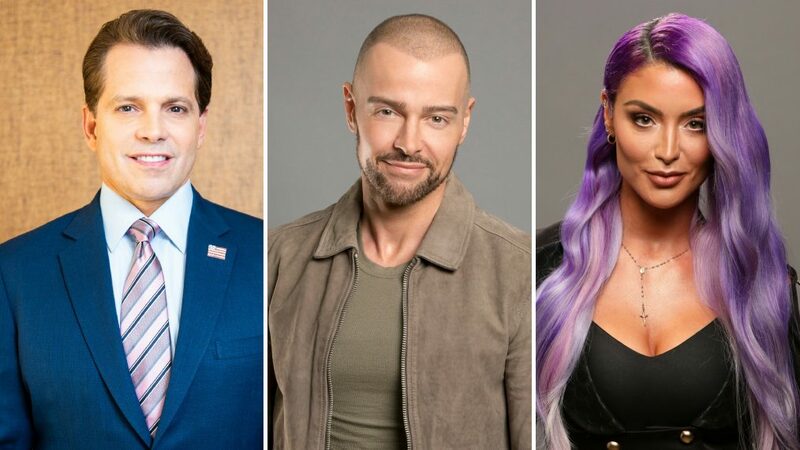 Anthony Scaramucci, Joey Lawrence, WWE's Eva Marie and more stars. Former White House Communications Director Anthony Scaramucci was among the many famous houseguests set loose in the Big Brother home. Not dissimilar to viewers at home, many of the guests, including comedian Tom Green, were fascinated by "The Mooch" and his presence in this reality TV form. Aside from Scaramucci's Donald Trump connection with former Celebrity Apprentice contestant Green, he also bonded with "momager" Dina Lohan, who lives also lives on Long Island. It isn't everyday that you find two Olympic athletes in the Big Brother house, but in Season 2 of Celebrity Big Brother that is the case, with swimmer Ryan Lochte and runner Lolo Jones in the mix. When Jones entered the house to find Lochte inside, she initially saw his presence as a threat to her game, believing that the other houseguests would target the swimmer and herself. To make matters more interesting, she and Lochte wound up going head to head in the Head-of-Household competition with their respective partners Jonathan Bennett and Tom Green. Ultimately, Lochte came out on top, but it's clear that Jones isn't going to back down from any challenge without a fight. From the get-go it was clear that Real Housewives of Atlanta's Kandi Burruss and singer Tamar Braxton weren't on good terms — both of them confirmed it during their confessional scenes. But that didn't stop Tamar from "extending an olive branch" by choosing Kandi to be her HOH competition partner. Unfortunately for Kandi, she didn't improve Tamar's opinion of her when she couldn't perform the challenge with ease. Will their bad blood continue or will these ladies become a team? At this point it could go either way. As Julie said when the guests entered the house — and as per Big Brother protocol — "expect the unexpected." When Ryan Lochte and his partner Jonathan Bennett won the first round of the HOH competition, Julie then revealed to them that they will go head-to-head for the coveted position, while the loser will be one of the first members on the chopping block. Will these fast friends turn into foes? Fans will have to tune in to find out.